As with any technology, the general public will choose convenience over quality too. You're right about durability; our TVs have traditionally lasted well over 10 years and my 12 year old 32" widescreen CRT did have a wobble but was easily repaired. However, it was an imposing beast. Seriously huge and weighed a ton. It dominated the room and DLP seemed even bigger. I've replaced it with a bigger screen that I'm able to move around myself and the amount of space it's freed up is astonishing. We still have one other 32" ws crt and I can't wait to replace that too because the room will breathe a sigh of relief. That's unusual. The plasma should still out perform the LCD. Maybe it's an age/brand thing, but the rule of thumb is that you definitely only consider plasma over a certain size so it isn't superseded tech at all. My TV has a Video Output set of choices where it asks you if you are watching Sports, Movies, etc... I have that set to Movie and then there is a setting where you can set it to 120mhz which it says give a smoother and sharper picture. I've actually tried that with it on and off and could see no noticeable difference. My bluray player does have a 1080p/24 mode where I assume the 24 if the fps you speak of. I actually have that set to Auto Detect where it is supposed to give you the optimal settings based on what you are watching. It's still too early for me to make a fair judgment as to the level of quality especially considering I really have nothing to compare with except my old CRT tv and regular dvd player. When making THAT comparison it's hard to say it's anything less than spectacular! Of course I have plenty more tinkering to do in the days and weeks ahead. Thanks for all the great info folks! I'm certainly getting educated quick. They're America's ultimate weapon. Charlie Sheen (Platoon), Michael Biehn (The Terminator) and Bill Paxton (Twister) team up as three of America's finest Navy commandos in this pulse-pounding adventure that brings out the heavy artillery for explosive action and breathtaking suspense "that will leave you clenching your teeth" (The Washington Post)! The Navy's elite SEAL (SEa, Air and Land) squad is made up of the best of the best: supreme warriors who take on dangerous missions no other fighting force would dare attempt. Sent to rescue the crew of a U.S. aircraft held hostage by mideast terrorists, the SEALs know that their skills will be put to the test. But when they discover that the terrorists have seized the plane's arsenal of deadly Stinger missiles, they're thrust onto the frontlines of the battle of a lifetime. A favorite action flick of mine... it's been a few years since my last viewing but it still holds up nicely. Charlie Sheen has been one of the Two & A Half Men for so long now that you almost forget he did a few movies... some good performances as well. I include this one as one of his better roles too as the maverick SEAL Hawkins whose mouth and actions often land him in trouble. Sheen should have little trouble acting the part given his real life tribulations. Michael Biehn has always been a favorite and I forgot Bill Paxton was in this. The two will later appear together again in Tombstone. Great action with some humor thrown in the right places. Two thumbs up! Convoluted story about a game of riddles that leads to murder. Very much a movie of highs and lows. There are moments where you are on the edge of your seat and long extended periods where it is painfully boring. During these lulls I found myself getting up and finding something else to do. This was a joint Canada/New Zealand production with Toronto the city where the story took place. Lots of Canadian content in the movie as well with the attractive Carly Pope, Brendan Fehr and perpetual geek, Jay Baruchel. Ian McShane lends some veteran presence to this mostly younger cast with a good performance as well. Weird movie with some decent moments but at the end, which wasn't necessarily a bad ending, it did leave me a bit confused. That's interesting because you've reminded me of something now. You should try setting the player specifically to 1080p/24 mode and see how the TV reacts. I found the "Trumotion" (your 120mhz?) thing wouldn't actually work properly until that was set (even though I didn't like it when I did see it working!). And as for those output choices, is one of them "off"? Because that's the one I use. As I said before, I don't like the TV interpreting what it's receiving. I want a naked signal, so to speak. I mean, we all know how different film-makers can be, it makes me wonder exactly why "Movie" mode is so different to some of the others. I'm still farting around with a variety of settings. I do have the 'Off' option and switched it to that and yet see no noticeable difference. I'm thinking my inexperienced eye for such things is limiting my judment right now but as time goes on I'm sure I'll start to notice subtle differences between the various settings. Thanks for the advice! Inspired by the true story of a nun's relationship with a condemned man, this provocative examination of crime, punishment and redemption earned Susan Sarandon the 1995 Oscar® for Best Actress and Sean Penn an Oscar® nomination for Best Actor. Dead Man Walking is a "fast-moving and absorbing" film filled with "genuine suspense" (Variety) that will leave you awe-struck from beginning to end. Sister Helen Prejean (Sarandon), a compassionate New Orleans nun, is the spiritual advisor to Matthew Poncelet (Penn), a vicious, angry and complex murderer awaiting execution. Her dedication is to help others, like Matthew, find salvation. But as she attempts to navigate Matthew's dark soul, she encounters a depth of evil that makes her question how far redemption can really go. Can she stave off the fateful day of execution long enough to save Matthew, or will she discover a truth that will rock the very foundation by which she lives her life? First time watching this and what an intense, emotionally gripping movie it was. True story about Sister Helen Prejean, who at the request of a death row inmate, becomes his spiritual counselor. Inexperienced in such matters, confused and scared shitless, she knows she can't save his life but tries desperately to save his soul. Maybe Susan Sarandon's finest performance and certainly worthy of the Oscar she received. You could tell how much of an emotional investment she had in this role as she took direction not only from director/hubby Tim Robbins, but from the actual Sister Prejean who was a consultant on the film. Getting first hand accounts of the last week of this convicted killer's life right up to his execution would help any actor get into their role, least of all a great actress like Sarandon. Sean Penn also earned himself an Oscar nom for his role as the convicted killer whose pride, hatred and disdain for authority eventually works his way towards accountability, remorse and a small amount of redemption thanks to the kindness shown to him by Sister Prejean. No one can dispute Penn's convincing and powerful performances, particularly in difficult roles and he brought it home again in this one. I'm not exactly sure what message Tim Robbins was trying to convey with this movie save perhaps simple compassion. Dead Man Walking provides plenty of ammunition for both sides of the capital punishment debate and I found it did little to sway my own opinion on the subject. The pros and cons were pretty much a wash and I'd love to ask Robbins that question if I had the chance. I'm also interested to hear other people's take on this movie who have seen it before. It's for sure one of those movies that can inspire spirited discussion, debate and pondering. I liked the film, but it is one that I wouldn't go out of my way to watch again. DEXTER is back! The critically acclaimed and groundbreaking original series from SHOWTIME starring Michael C. Hall, returns on DVD with all 12 riveting and chilling episodes in DEXTER — THE SECOND SEASON. Although committed to carrying out his twisted brand of vigilante justice - Dexter begins to doubt his murderous capabilities and continues to be haunted by his tortured past. His difficulties multiply when evidence of his deadly after-hours activities begin to surface and the FBI is brought in to investigate the city’s new serial killer dubbed the “Bay Harbor Butcher.” Dexter can’t pause for a breath as the noose tightens and the questions keep mounting. Will he be able to continue his serial-killing ways? Or will Dexter’s dark past finally be uncovered? .... and the blood continued to flow. Season 1 was good but season 2 surpasses it on all levels. I knocked season one for not being edgy enough but they certainly picked it up a notch for round 2. I love how Dexter's conflicted nature comes full circle as a combination of his past, outside influences and the pursuit to catch him help him with his self discovery and acceptance of what he is and what he does. He is going into season 3 with the dark cloud above his head gone, a spring in his step and a new found appreciation for his craft. I didn't like Doakes much in season one but he kind of grew on me and even though I knew his departure was going to be inevitable I was still sorry to see him go. Jennifer Carpenter who plays Dexter's sister still irks me. There must be some way to fix her face.... although it was nice to see her start thinking for herself for a change. Some amazing cat and mouse episodes in season 2 and those thick with irony. Not wanting to jump ahead, but I am very anxious to start season 3 so that I can get to season 4 which I am hearing very positive things about. Goblins, trolls, griffins and other mythical creatures abound all around us... you just need to know where and how to look for them. Started watching this with my young daughter but she checked out early as the scaries were just a little too much for her. Myself, I thoroughly enjoyed this fantastic tale of a magical world in our own back yard. Great cast with the ever upbeat Freddie Highmore taking the lead. After discovering a forbidden book he unlocks it's secrets but also unleashes diabolical hordes that would take it from him for the powers that lie within. I picked out Seth Rogan's voice easily enough but didn't pick up on Martin Short until the credits. As Nick Nolte played the evil troll, it was a reunion of sorts for Nolte and Short who teamed up for one of my favorite comedies, Three Fugitives. Great effects, well developed creatures and a fantasy setting that interweaves with real life and real life problems as the children are dealing with divorced parents, an unwanted move and feelings of betrayal which in some ways are harder to deal with that the rabid creatures on the prowl outside. Great family movie with great action and thrills throughout. Kudos! Welcome to the Death Race, where hardened convicts and smoking-hot navigators race tricked-out cars in the most twisted spectator sport on Earth! Sentenced to the world's most dangerous prison for a murder he did not commit, Jensen Ames (Jason Statham) has only one chance to get out alive - win the ultimate race to the death. Also starring Tyrese Gibson, Death Race, is a "supercharged, sick and satisfying" (Nathan Lee, The New York Times) ride that will keep you pinned to your seat all the way to its insane, metal-crushing end! No random pick tonight. 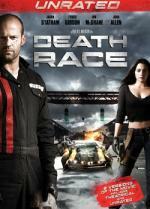 I was in the mood for some mindless action so I went for Death Race. I'm not going to try and make this movie out to be anything more than it really is... an action packed display of violence and gore. It requires no thought... just sit back and dodge the shrapnel! Loved it! I thought Joan Allen was perfectly cast as the warden/extreme sport promoter because just about every movie I have watched her in she has played a cross, miserable woman about a friendly as pit viper. She was rather convincing as the warden of Terminal Island, demanding respect and instilling fear. Jason Statham was predictable but so far I have not tired of his mostly one dimensional roles. You know what to expect from one of his movies and most times when I pop one in that's exactly what I'm looking for. What I find interesting is that with the direction that real life reality TV is currently heading in, and this might sound a bit ludicrous, but I could see this type of tv in the future. Reality shows are already pushing the envelope in terms of shock factor, tastefulness and viewer curiosity. What's left to reel the viewers in other than death on TV? It may be years away yet, but guaranteed someone, somewhere will do it. Isn't death on TV already there? I'm sure there are other examples but didn't the Farrah Fawcett series show her death? I don't watch reality TV and never will. Yes, but that was more documentary style. I mean when they turn death into a game show along the lines of The Running Man. Stephen King (as Richard Bachman) wrote a good novella along those lines called The Long Walk which predicts that death in competition will be a glorified, worldwide media event in the future. It's a great read and scary stuff! Yes, but that was more documentary style. I mean when they turn death into a game show along the lines of The Running Man. Too bad the film isn't as good as the book, the book is more serious than the film is (not that the movie isn't good, but too different). Yes, the book was better for that story too, also written as Richard Bachman. I have so many 'must-watch' movies here it's hard to know where to begin which is why I usually resort to my random selections to choose for me.